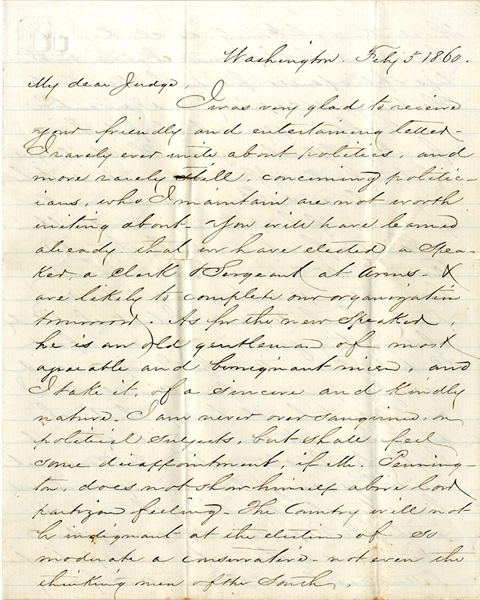 A great ante-bellum Georgia Senator's letter, 7pp. 4to., written by pro-Unionist Joshua Hill (1812-1891) who as an outspoken opponent to secession was forced to resign from Congress in 1861 when his state threw her hat in with the South, Washington, Feb. 5, 1860, to "my dear judge", reads, in small part: "…we have elected a speaker, a clerk & sergeant at arms & are likely to complete our organization tomorrow…the country will not be indignant at the election of so moderate a conservative-not even the thinking men of the South…Mr. Crittenden…have attempted to get up a new party, for the Union. I took the liberty of suggesting your name as one of our Central Committee for Georgia…the party seems to command itself most highly highly to the old National Conservative Whigs…the Republicans are more controlled by Corwin…& H. W. Davis than by Seward, Sherman & other extreme men…I do not regard Sherman…an ultra anti-slavery man…the Democrats [tried] to make him an out and out abolitionist…our new party will compel the Republicans to select for President a moderate, conservative, natural man…we think we can carry Maryland, N. Jersey and Delaware if we can do no more. If we force the Republicans to nominate Bates, Bell, Everitt, Fillmore or any such man the triumph of conservatism will be complete…the country will take new hope…the Democrats have already failed to make…capital out of [John] Brown's raid (as the phrase goes)…they attempted to create the impression throughout the entire South that it was the advance guard of a well organized anti-slavery army that would attempt to lay wreck the South and carry in its train the unnumbered ills of a servile insurrection. For a time the fires of discord burned brightly and the Southern heart seemed awakened to a sense of impeding horrors. But the fur of the storm soon spent its force and…a serene calm fell upon us and men began to breath freer…the mad enterprise of a crazed enthusiast [like John Brown who was] attended by a few knave and fools…[caused]…innocent blood…to be spilt [and] was, after all, not a revolution. Gov. Wise in his earnest to turn the affair to personal and party advantage made himself supremely ridiculous…and his mother Virginia would…be glad that he had been out of her Executive chair…in a conversation…with Mr. Bottes referred to…that peculiarity of our opponents in Georgia. He…replied 'yes and…while our people hesitate about a step that they do not know to be clearly right the Democrats…stand peacefully by what they know to be wrong. '…I don't see what better we can do as good Americans than to stand by the Constitution and the Union and the enforcement of the land of the Union." I hope you will co-operate with us. We fight for the country and expect no spoils…Joshua Hill." Hill was an attorney from Georgia who, as a member of the Whig and then Know Knowing parties, displayed strong Unionist principles while serving in the U. S. Senate from 1856-1861. He opposed secession, but was forced to resign his post after Georgia seceded from the Union in late January 1861. He took no role in politics during the war until he ran for governor of Georgia in 1863; a bide he lost to Joseph E. Brown. After the war he took active role in Reconstruction and in 1872 worked closely with Charles Sumner on a civil rights bill. Near fine.